Friday. One day remaining till the mystery is solved, but we can’t possibly be further from the truth than now. Atleast, we have the following clues now: The Valenzetti Equation chain is complete, revealing a picture of an evil penguin, with the 6 words used being: Tundra, Cold, Cavern, Harbinger, Icy and… Evilpenguin. The latter being revealed a day too early, but still included in the “master.css“-file. The last rune at the top seems to be a Viking Compass, which fittingly resembles “The Lost Vikings”, another Blizzard game. In the picture itself, the eyes have become more visible and bright, seemingly smoking (or looking like horns, perhaps? ), bringing the resemblance back to some of the key figures of.. well, pretty much all the big game series they’ve created. 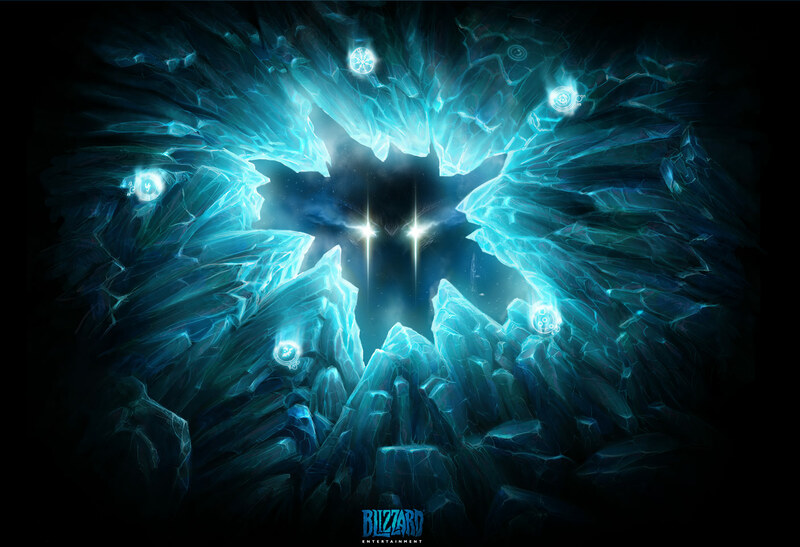 What will emerge from behind the icy wall, if it has to be Diablo-related? Tyrael’s face (as that has never been seen)? Belial or Azmodan, the two lesser evils that sought to get rid of the 3 primes, so they could take over? It’s a major tease, that’s what it is. Hats off to Blizzard for that one, yet it’s going to be really exciting to see the last picture, if any, tomorrow. I’m still hoping though, but I can’t make decipher anymore of this splash-screen, besides hope. For now, I’ll attempt to get as far into Diablo II, to remind myself of the story. Oh yeah, and it starting raining and thundering outside. Sadly, the lightning isn’t pink, or sounds that way. However, as my defense, I had a horrible hangover at that day, and when I was finally able to write, the announcement had been made – and thus, it didn't really feel needed to post about it. Anyway, the only real “thing” that was changed was – as far as I can remember – the runes glowing, and the strange 6th rune that showed a winking smiley.